As a sewist grandmother, I set my sewing boundaries a long time ago. “I’ll sew anything you want and will do everything possible to be a wonderful grandmother but I won’t sew Barbie doll clothes”. Hmmm. Maybe I’m not living within the established limits. Through a series of events, 10-year-old Mira (with my assistance) is now sewing a “Queen Elizabeth” dress for a Barbie doll. As for me, I got sucked in big time. First, here’s a little background. 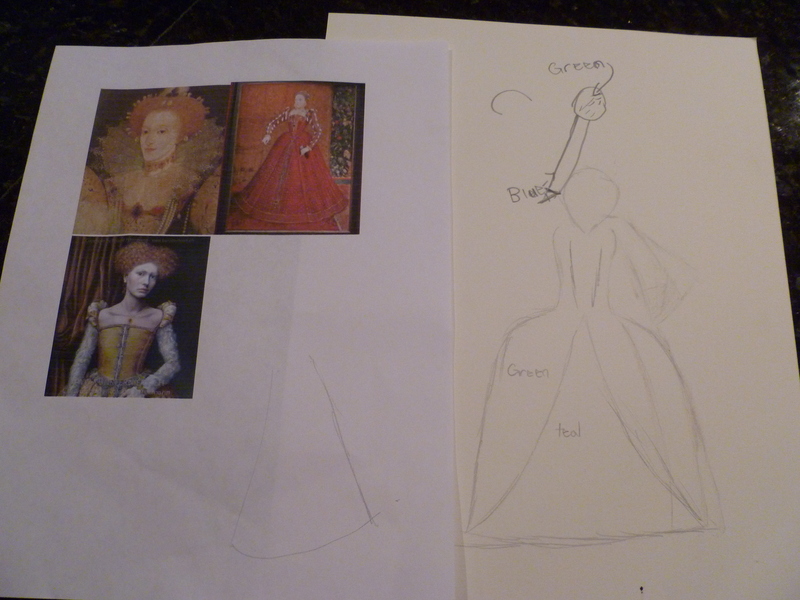 Way back then, using a “World Book Encyclopedia” drawing as a guide.I sewed a “Queen Elizabeth I” doll for a history project. Admittedly she was special and was one of the few childhood items I’ve kept. 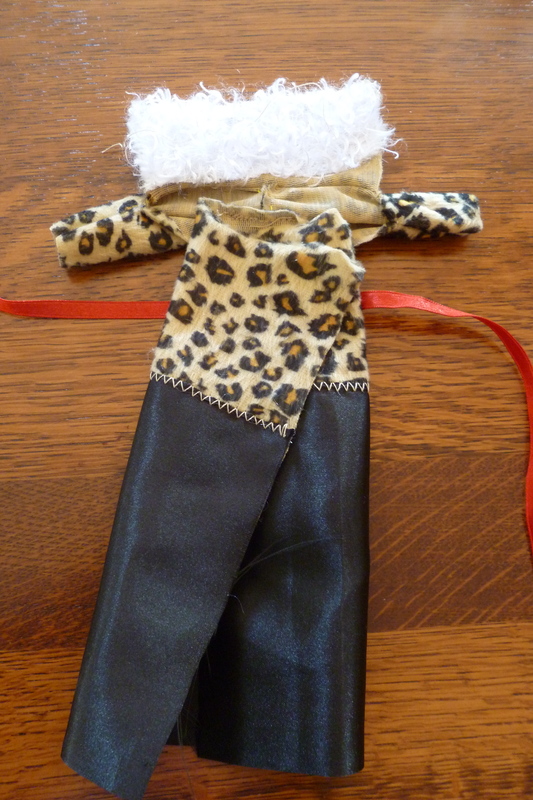 Several months ago I found the doll still in a shoebox, tucked away with other memorabilia. Like my sister and daughters, Mira and Cate were captivated by her. Soon after, Mira set off to make her own version. 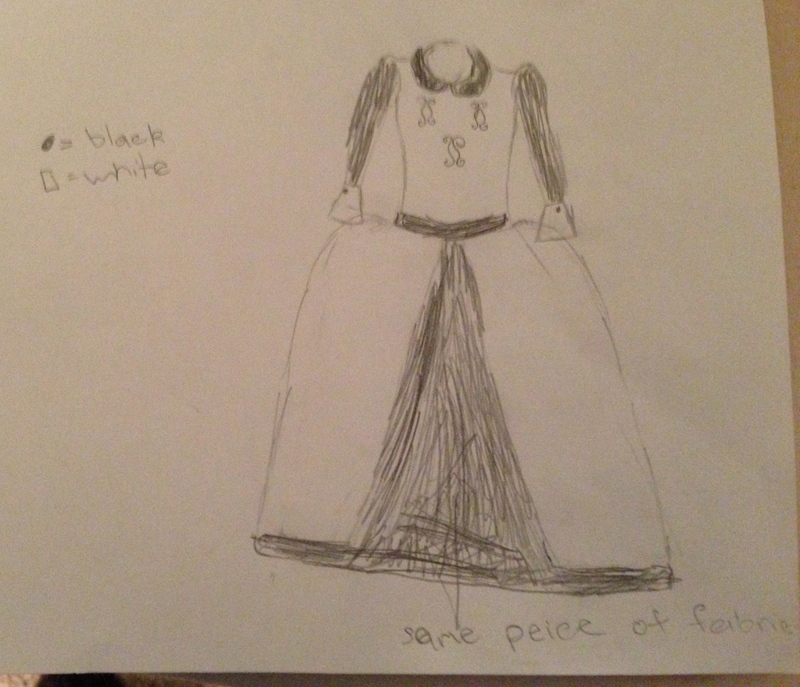 She searched the internet for images and then drew her preferred dress design. 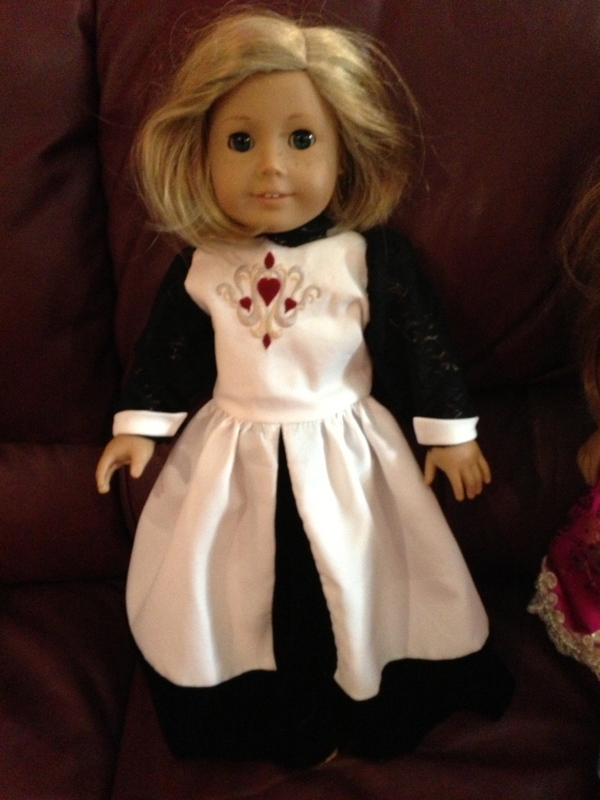 My job was to make it into a doll pattern. 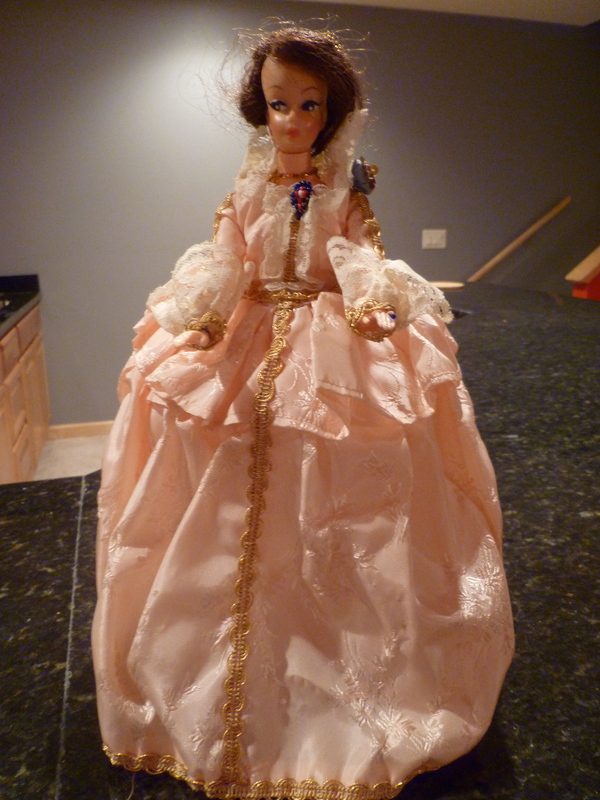 Yup, the doll came from a garage sale and her name was Barbie. When the dress is completed, I’ll be sure to show you the result. In the mean time, here’s the design. 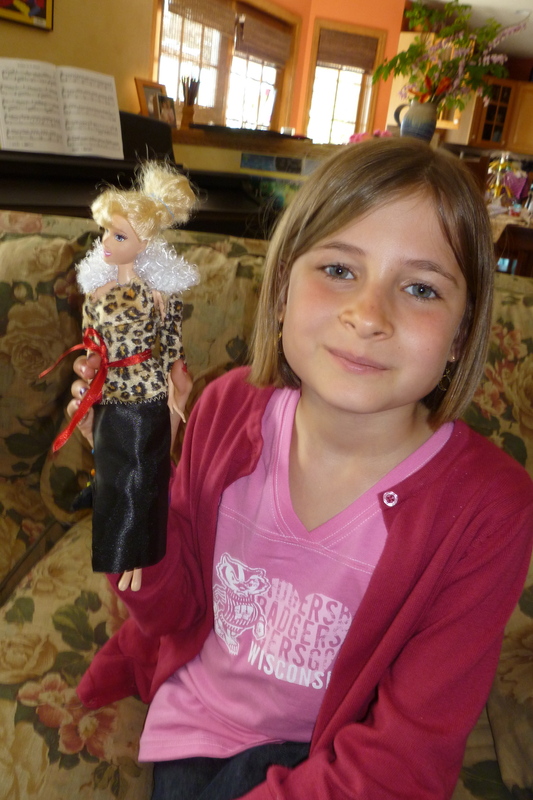 What’s more, the last time Mira was at our house, she wasn’t satisfied that the Barbie’s hair had enough curls. As we parted that day she said, “Ramma (that’s Gma), can you curl Barbie’s hair so it looks prettier”? 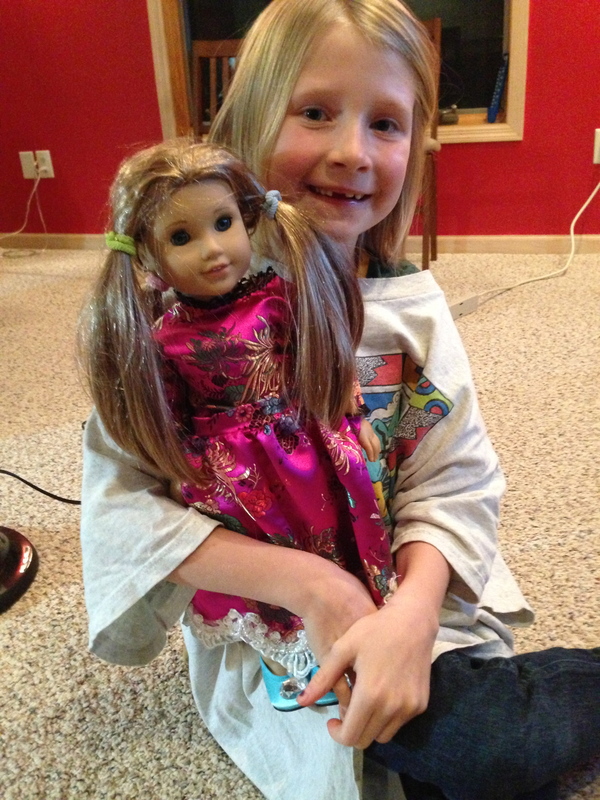 Well, how in the world do you curl a Barbie doll’s hair? Finally it occurred to me that possibly some strips of fabric would work. After all, Ma Ingalls used rags to curl Laura’s hair. 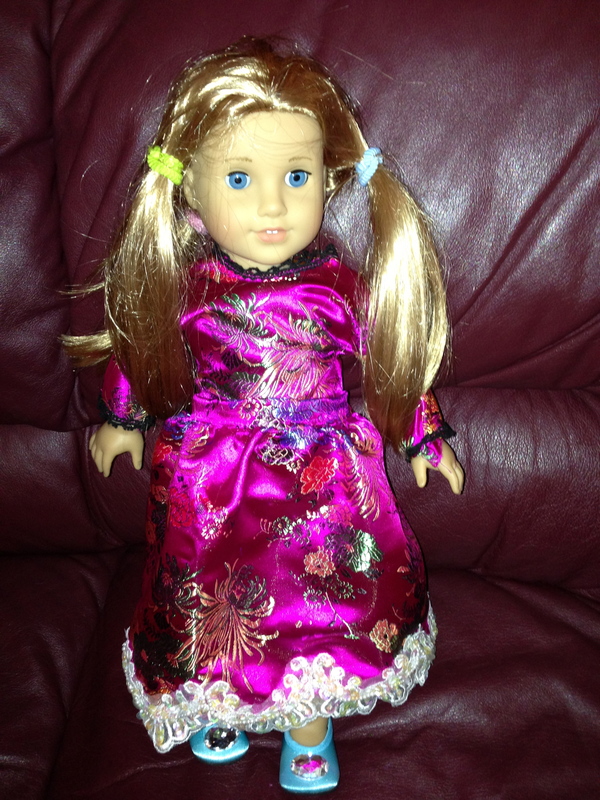 So one night while watching a movie, I cut strips of fabric and curled the doll’s hair …. and waited until today to see the outcome. In case you’re wondering, I rolled the hair ends into the fabric, curled it around and then tied the fabric strips in a knot. Just writing this makes me crazy. Is there anything we won’t do for our precious granddaughters? Not only have I crossed the line by sewing Barbie doll clothes but I’m also a Barbie doll cosmetologist! What next? Tonight Mira removed the fabric strips/curlers and here’s the result. 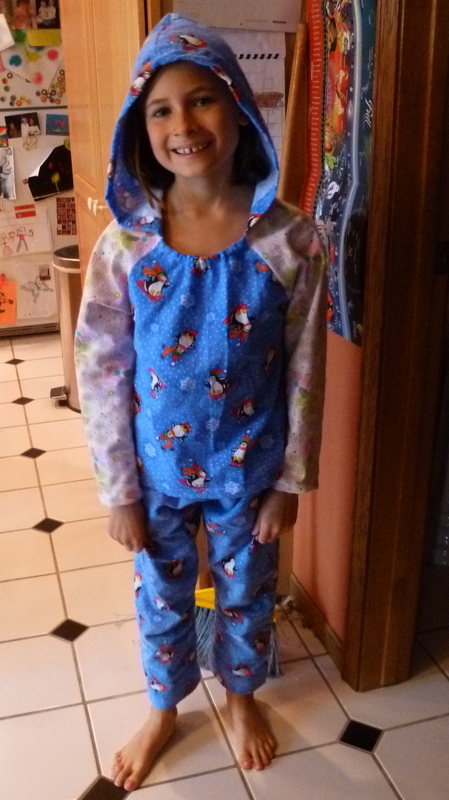 Several weeks ago I blogged about my adorable granddaughter Mira’s desire to make a pajama top. 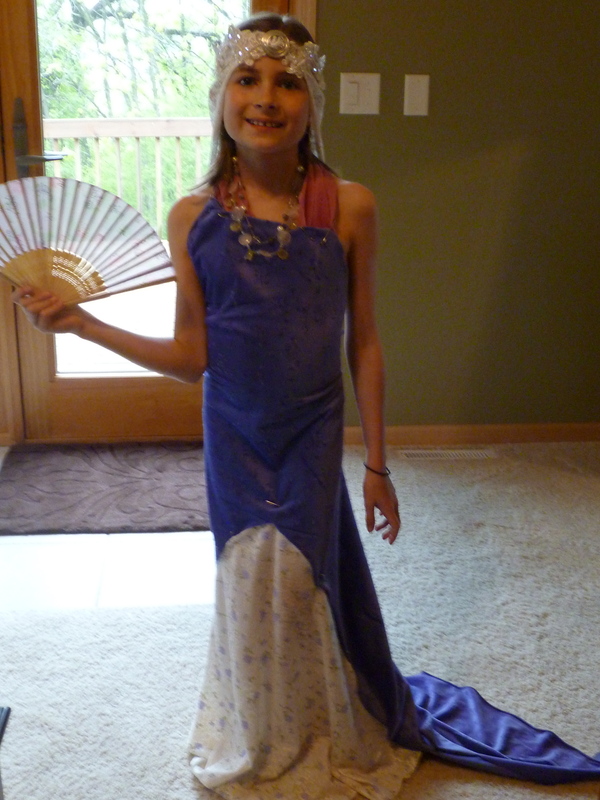 At the time we made it, she said she wanted to add a skirt, so I shouldn’t have been surprised that during our sewing date last week, she wanted to fulfill her fashion dream. 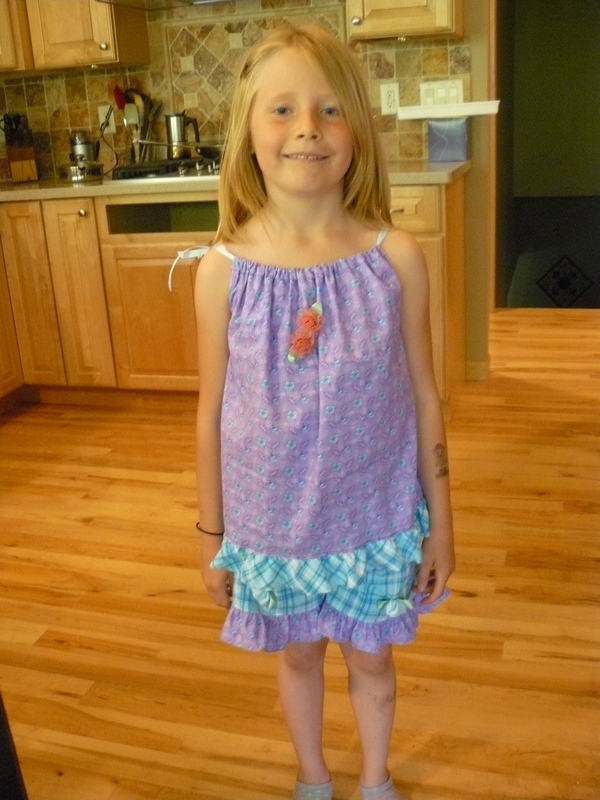 After she drew a picture of what she was envisioning, we set forth on adding a skirt to the pj top. 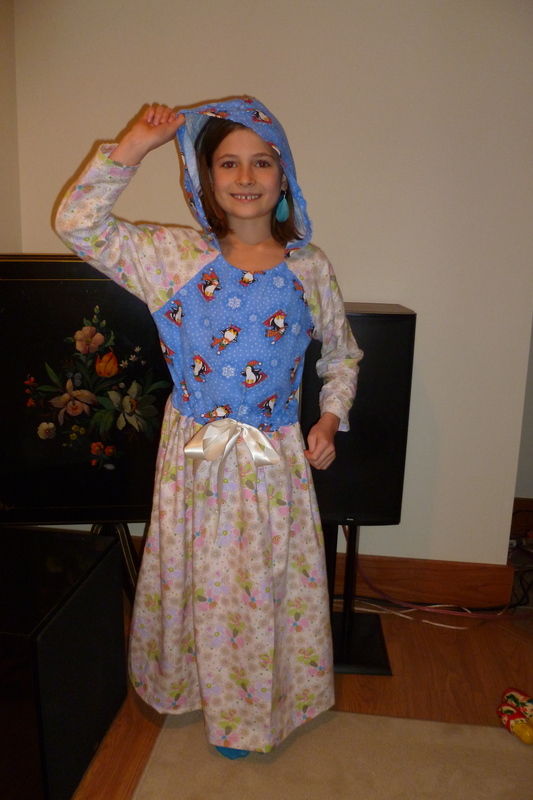 She could see what I couldn’t – a nightgown (that would likely double as a princess dress). As Mira is still new to machine sewing, I was unsure about the complexity or time it would take to gather the skirt, so I pleated the skirt fabric and she sewed it to the top. After hemming the skirt and adding a casing at the waist, Mira fed a piece of ribbon through the casing. That night she slept well in her new nightgown. Patiently waiting for her turn…..
Me: “OK, that will work but I’ll need to be very close to you”. Me: “OK” (while I checked to make sure the machine speed was on low). 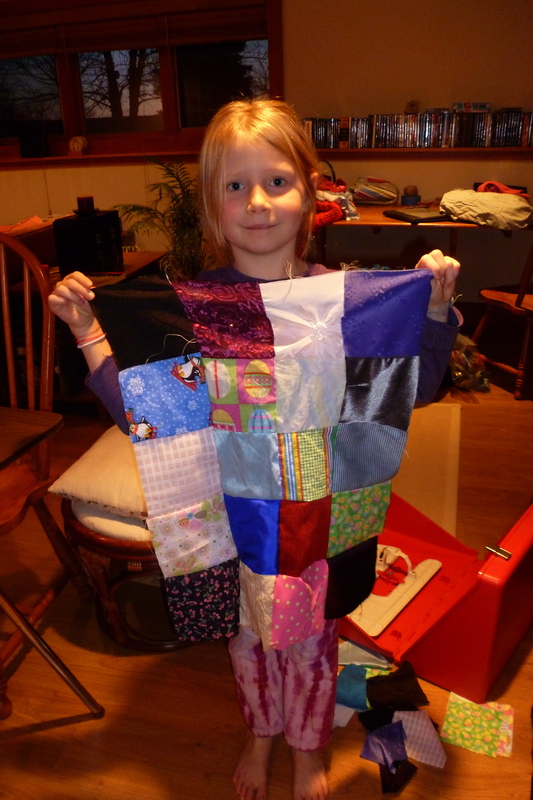 We then sewed a few squares onto her quilt. Cate: “I think I’m ready to use the thread cutter like Mira does”. While I wanted Cate to be able to go solo, I was keenly aware that she’d be safest with some assistance. She quickly sewed a dozen or more squares and then said, “Now what can we sew?” We found enough quilting cotton to make a pillowcase. 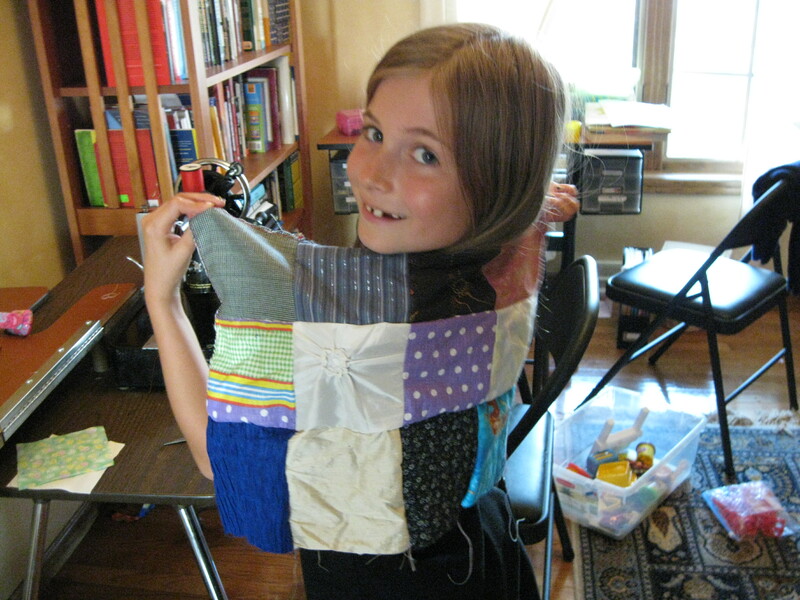 Her sister soon followed with the same project and then Catie started her second quilt. What a busy yet fun afternoon we had. 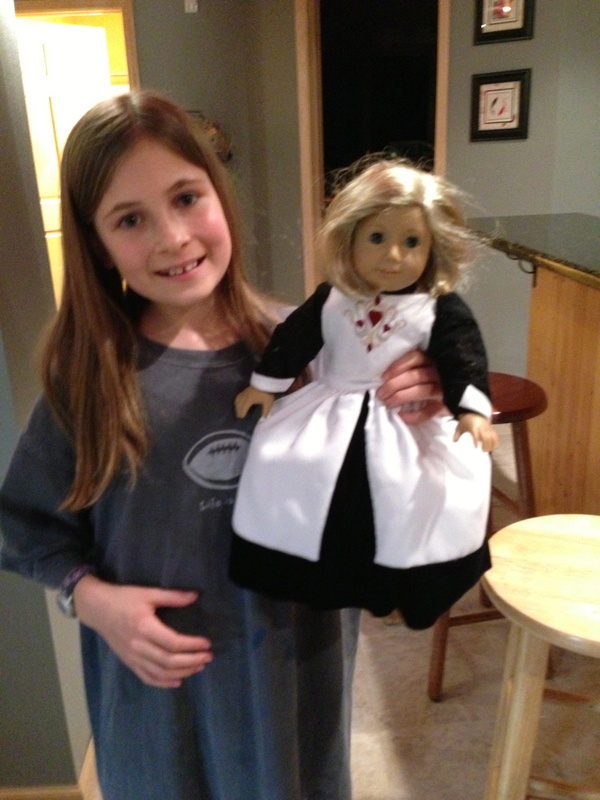 I am still shocked that at age 6, Cate can use a sewing machine with minimal supervision. 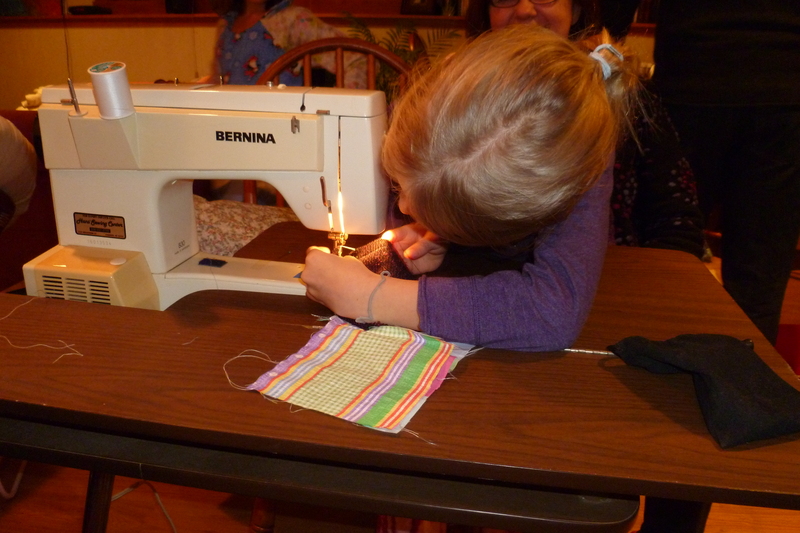 I’ve read that six-year-old’s sew with a machine but honestly I didn’t believe it. Now I do. What suggestions do you have for their next projects? 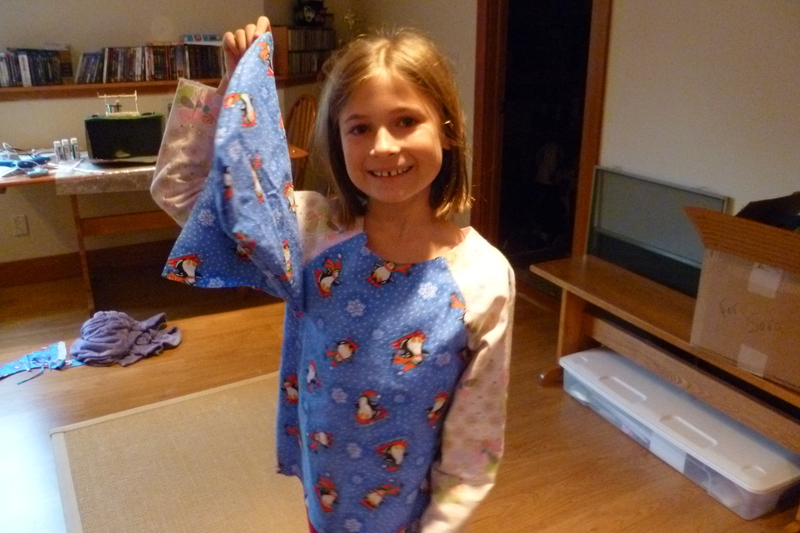 On several occasions in the past year, I have blogged about by GD Mira’s progress in learning to sew. She has been very eager to learn to sew however because we see each other infrequently, there are months between lessons. (When we move from Philly to Wisconsin this will change). On our last visit to Wisconsin and after not being together for about 3 months, Mira couldn’t wait for her lesson. On a phone call before our visit she asked if we could have some special time together: “I have something special to show you”. I wasn’t sure of what was up but now I know that she was excited about her “creation”. Once again this turned out to be a lesson for me. I didn’t understand that she wanted to “create” and I was thinking that she wanted to sew. Now I understand these to be distinctly separate goals. 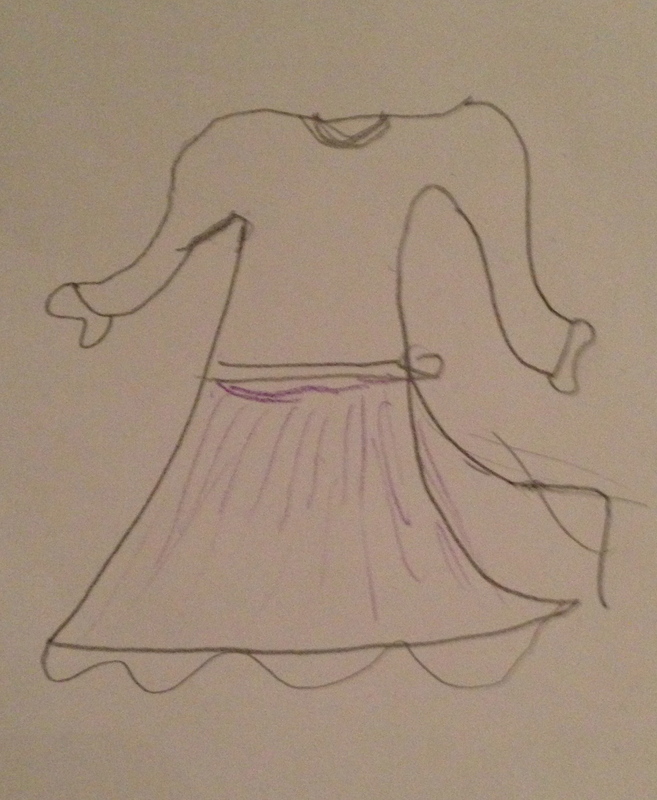 I came to the after-school lesson with a piece of pre-smocked sun-dress fabric, thinking this would be a quick win. She could sew up the side seam and add ribbon for the straps. Quick and easy and she would have a sense of accomplishment. Wrong I was. About a year ago, Mira received a Fashion Design Kit, which includes a small dress form. 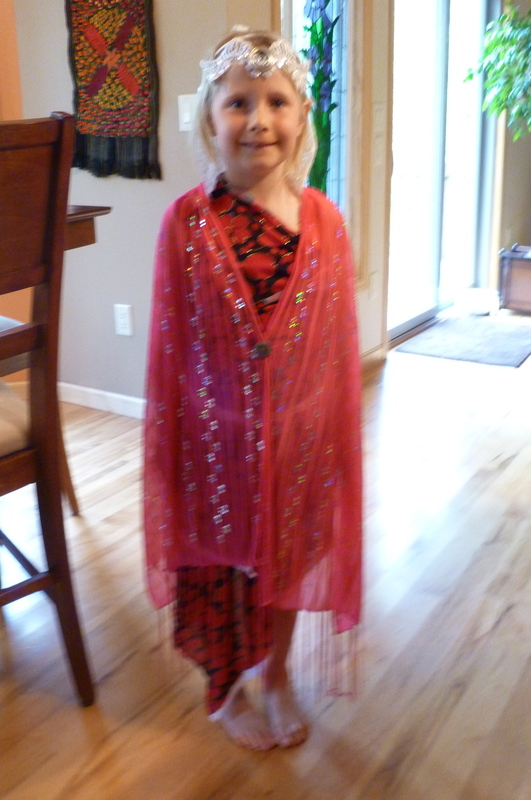 For a long time she didn’t play with it but prior to our lesson she draped the dress form with several pieces of fabric. She had ever so carefully pinned her design onto the dress form (sorry, I forgot to photograph) and some of the pieces were already hand-stitched. 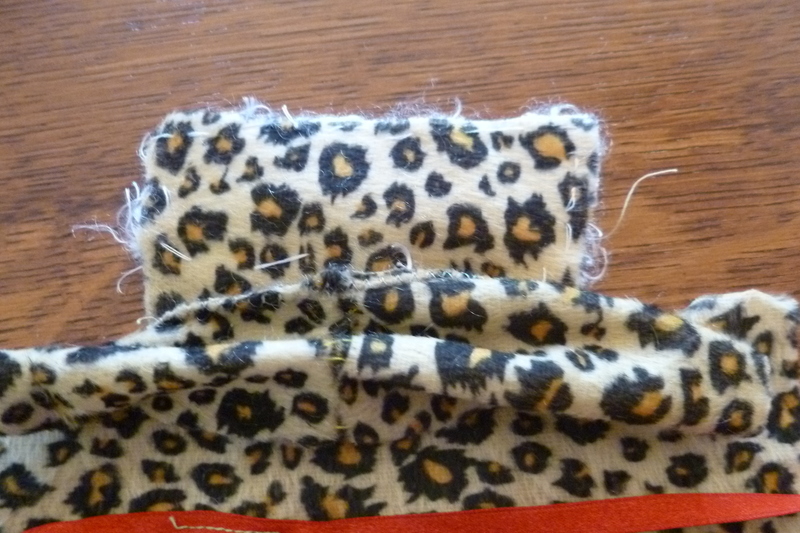 In the following photo you can see where she hand-stitched a small collar and as well as the back seam on the leopard fabric for the jacket. Together we discussed options and decided on a plan to convert her idea into an outfit for her Barbie Doll. Mira used the machine to sew the jacket to the skirt, dictating that the length of the skirt had to be “just right”. Somehow I needed to construct sleeves, which were a part of her intended creation. Together we pulled it off, and then she sewed a red ribbon onto the outfit – the perfect alternative to sewing on snaps; or worse, a buttonhole and button. Last of all Mira sewed several sequins on the top to make it ever so special. And here is the proud girl with her creation. For many reasons, I can’t wait to live nearer to our GD; having more time to teach Mira to sew is at the top of the list. She really enjoys it and already understands that it’s a creative outlet. 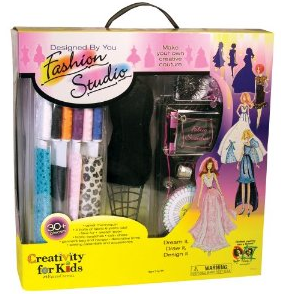 Note: If you’re thinking of purchasing a Fashion Design kit, please be aware that the model/dress form is quite a bit larger than a Barbie doll. This was a little bit frustrating but in the end we were able to use a real Barbie to assure that the dress would fit properly. 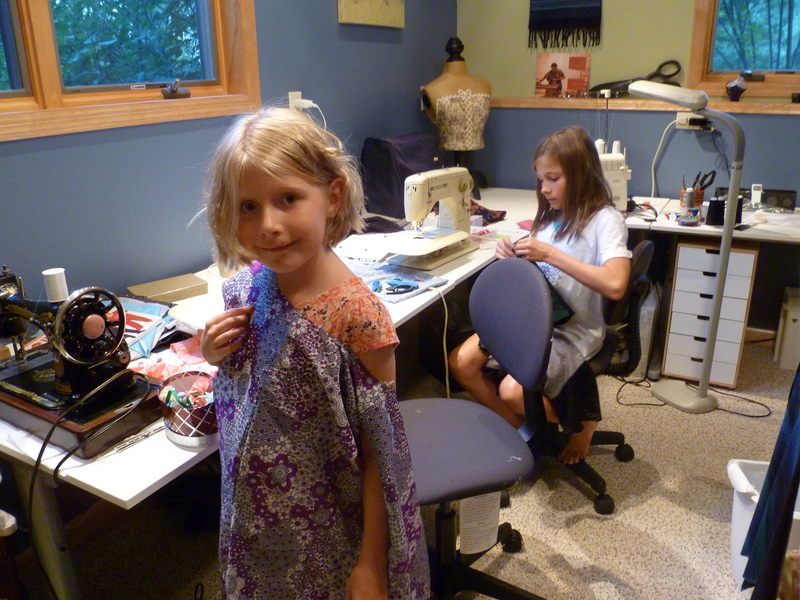 Previously I’ve blogged about the pleasure I get from having granddaughters who have an intense interest in all things sewing. When we visited over the Christmas holidays, I took with me some pre-washed flannel and a pants pattern with the hope that if asked, Mira would want to sew her first piece of clothing. 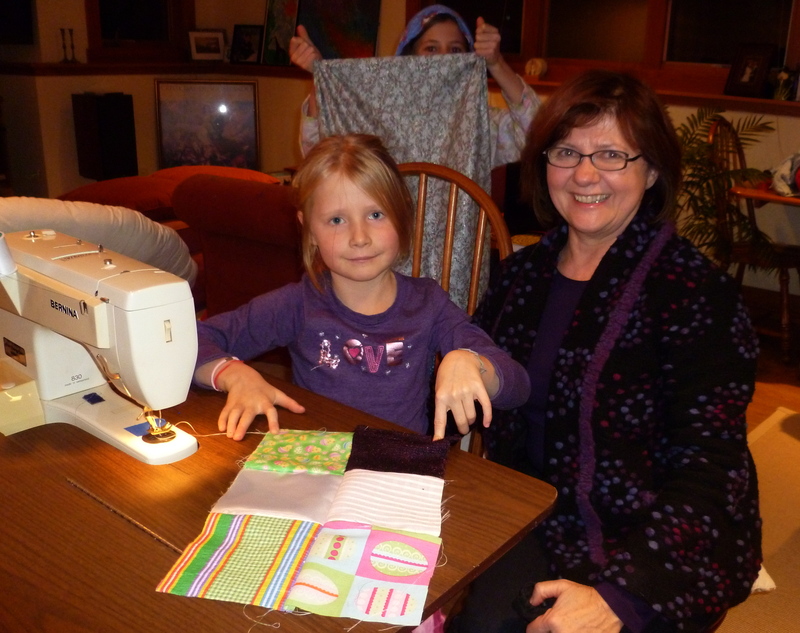 When I made the offer to spend some special time sewing with Ramma (grandma – that’s me), she wanted to begin immediately. Mira could hardly wait for me to cut the pieces and to pull out the sewing machine. Following a safety review (hold your hands at each the side of the needle, never put your fingers under the needle, etc) she immediately began to sew the pieces together. For each joining, I stood by her side but she guided the fabric and back-tacked at the beginning and end of each seam. After each seam, amazed by her accomplishment, she ran upstairs to show her grandfather (fondly known as Racka) the progress. Within an hour she had completed the pants including making the casing and pulling the elastic through with a large safety-pin. In fact drawing the elastic was quite fascinating for Mira’s 8 year-old inquisitive mind. By this time her energy was waning so I quickly hemmed the legs. Rightfully so, Mira was extremely proud of her completed project. She put them on and ran to show her grandfather; later that day she was equally as thrilled to show her parents. 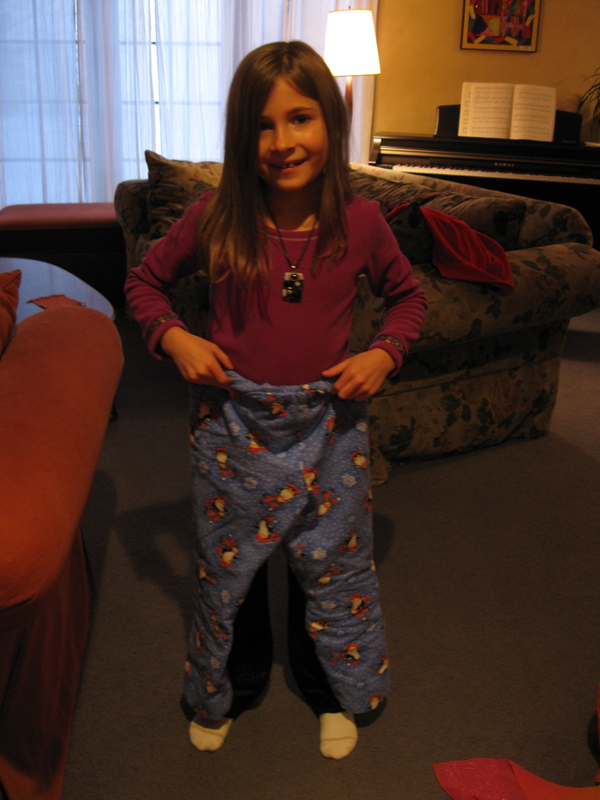 Mira took the completed pj’s to show her teacher the next day; she wore them as day clothing for several days and took them with her when visiting family and friends. This weekend we visited again and the glow hasn’t worn off – yesterday she took the pj pants to a Superbowl Party so she could show them one of her aunts. Nor has my glow worn off! 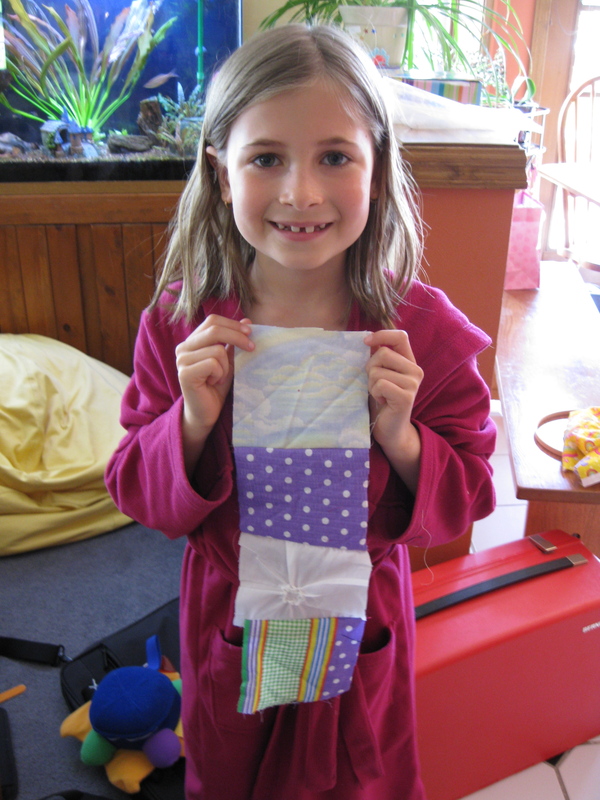 Teaching a child to sew isn’t something I have expertise in, so my efforts with GD Mira are somewhat of an experiment. Like many experiments or sewing projects there are successes and failures. 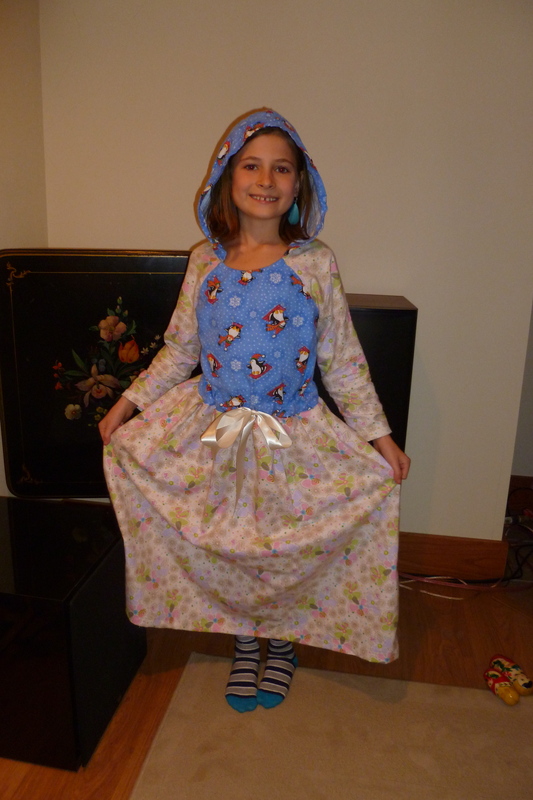 Several months ago I proudly blogged about 8-year-old Mira’s first attempt at machine sewing with her mother’s sewing machine. Sewing lesson #2 was several weeks ago, which from my perspective wasn’t as successful. Her viewpoint may have been different as the quilt she’s making is now 16 squares and she continues to be quite proud of her accomplishment. Here’s the story. Several months ago I bought a Singer Spartan vintage sewing machine for $9.95 with the hope of replacing the motor with a hand crank. Through a series of unrelated events, this too heavy to be mailed machine was transported from Philly to Mira’s house in Wisconsin. Prior to our visit several weeks ago I ordered a hand crank for the machine (this little attachment was surprisingly heavy for the size of the wheel – I guess maybe that’s the point). In case you’re wondering if it’s difficult to convert to a hand crank, it took our technically inclined SIL Stephen about 5 minutes to remove the motor and install the crank. My thinking behind this was that it would be easy for Mira to use a hand crank machine independently – much like a child’s sewing machine. 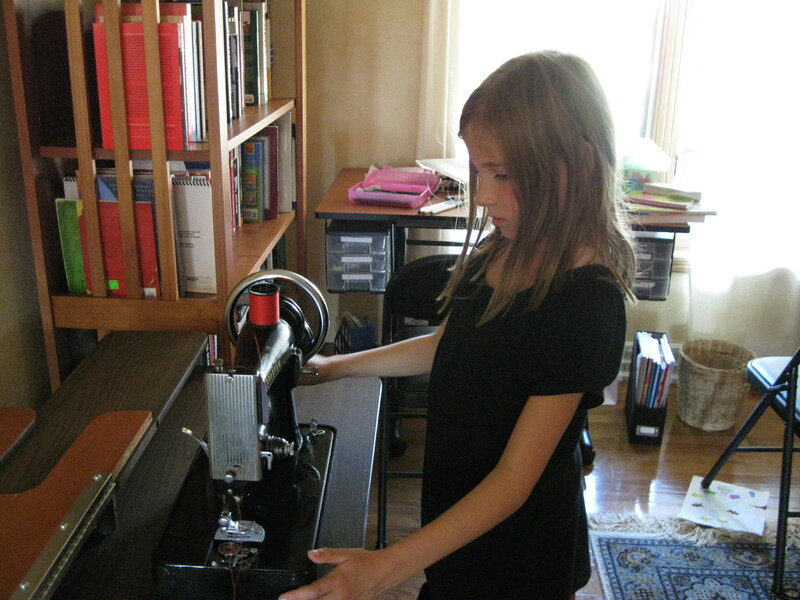 Additionally I thought possibly the hand-crank machine would make it possible for Caitlin to sew as well – after all if big sister does it, so will Caitlin. It turned out that I was a little off-base on this thought process. The hand crank was actually difficult for her to maneuver; needing to turn the crank with one hand and guide the fabric with the other was difficult. Maybe the tension wasn’t set correctly or the needle was too large but at times, the needle didn’t go through the fabric easily which made it even tougher for Mira. She felt much more competent when she used the electric machine, which she could do without my assistance. On the other hand, this was a great solution for Caitlin, who now has 4 pieces sewn together. She loved turning the crank while I held the fabric. In this case, higher tech was better. Next time I’ll pull out the electric machine for Mira and will tag-team with Caitlin to use the hand-crank. This experiment didn’t work as I anticipated but then how would I know if I hadn’t given it a try? 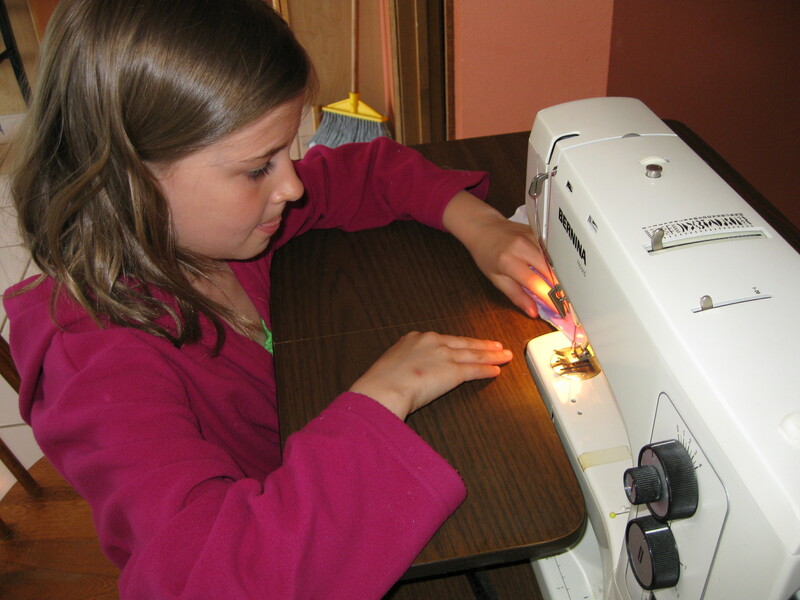 When are Children Ready for Machine Sewing? 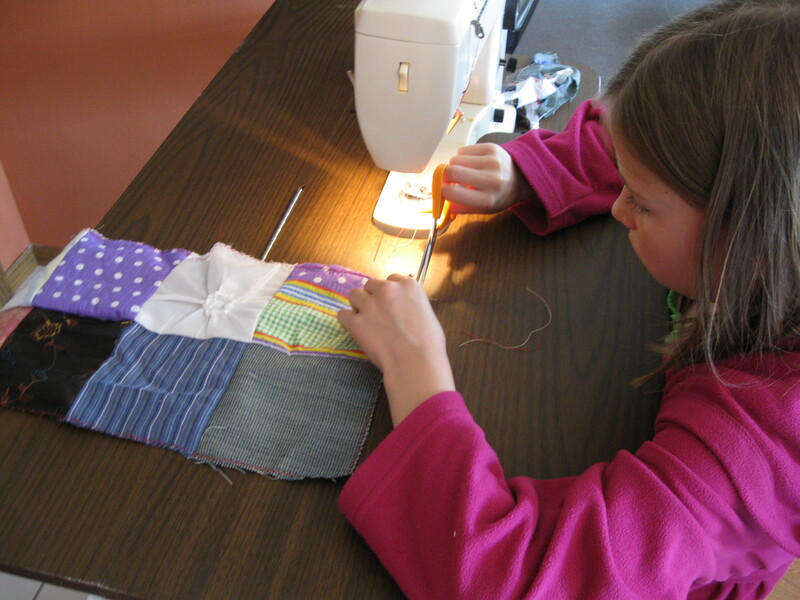 Many of us can remember our childhood sewing experiences. 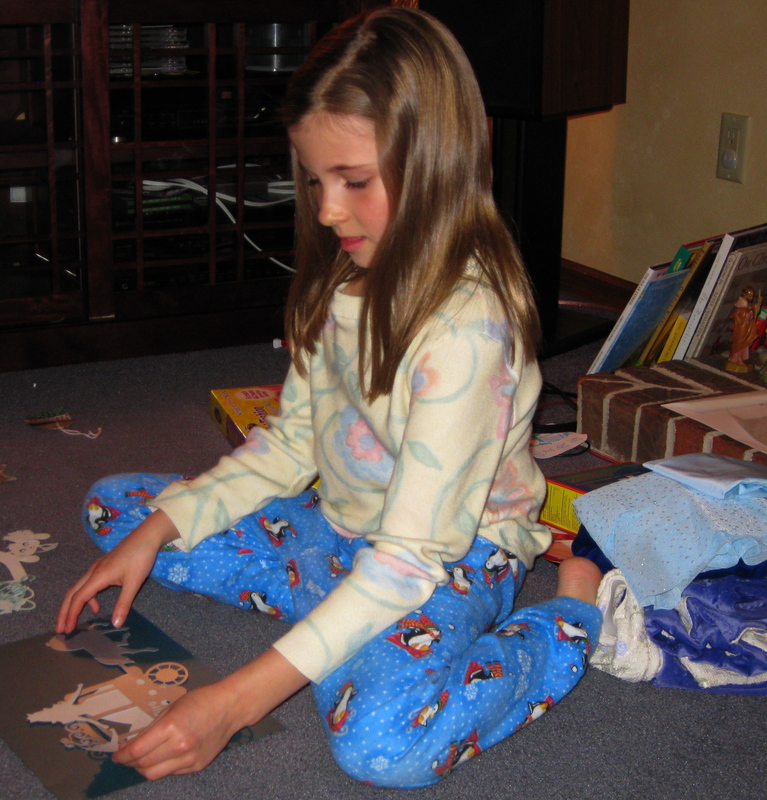 For me, my first recollection was sewing cotton strips that my mother would later have woven into rag rugs. 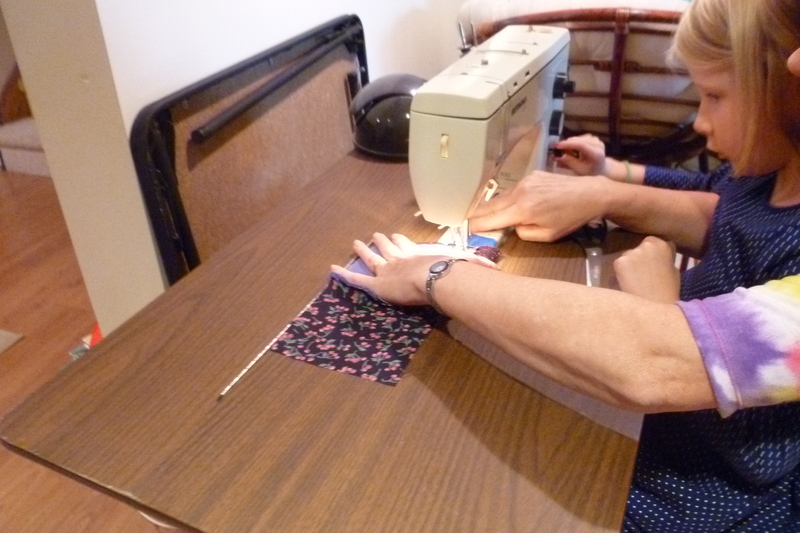 From her cotton sewing scraps, my mother tore strips of cotton about 1″ wide and the length of the left over fabric. Bags of these strips would need to be sewn together in a straight forward and back pattern and the long strips were then rolled into a ball. What fun for a kid who wanted to start to sew. I’m not sure but I was probably about 9 or 10 years old. I tried to find a few references to cotton rag rugs but even on the web they were pretty hard to find. 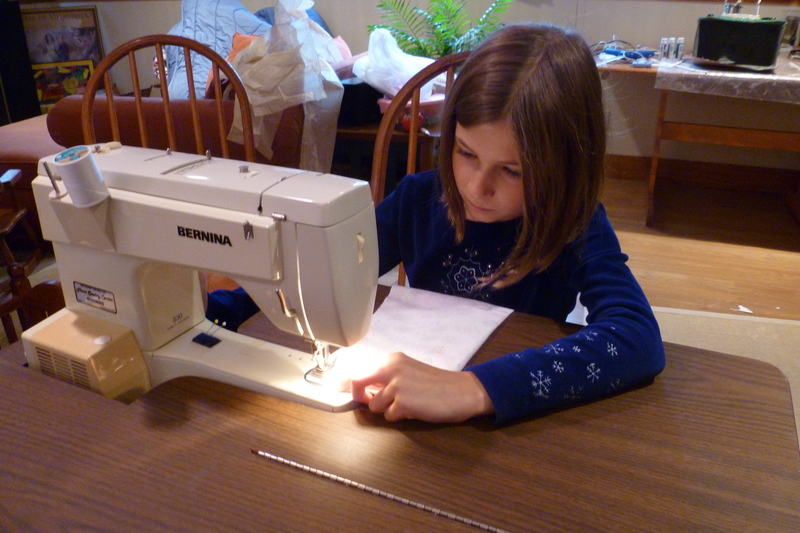 Because Mira, who is now 8, has such an intense interest in all things fabric and sewing, I was eager to give her the opportunity to try sewing with a machine. In May when we visited I had the perfect opportunity because I had already set up her mother’s sewing machine, which is my old Bernina 830. When Mira and I were the only ones awake early in the morning, still in our pj’s, I asked her if she would like to learn to sew on a machine. She was delighted with the opportunity. 1. 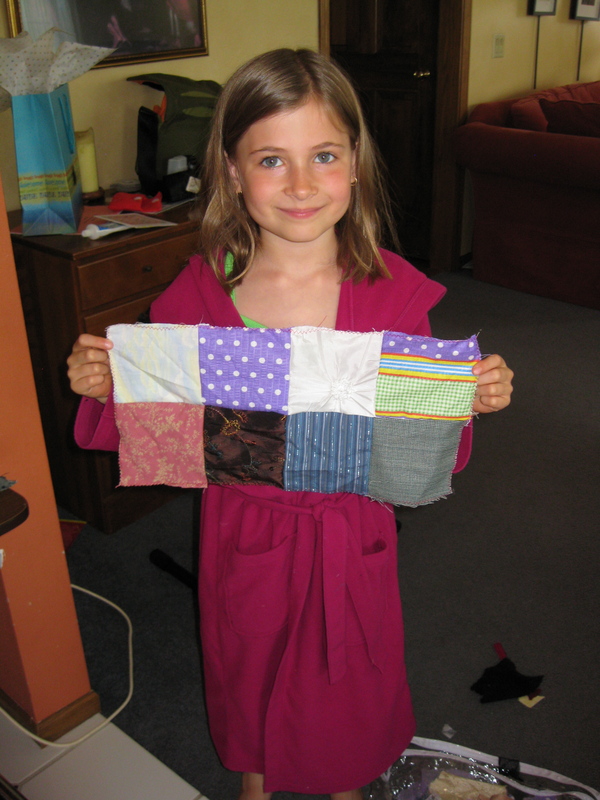 Our choice was to make a quilt, so Mira pulled out her stash of fabrics, which consists of a fairly large bag with an assortment of small scraps. 2. 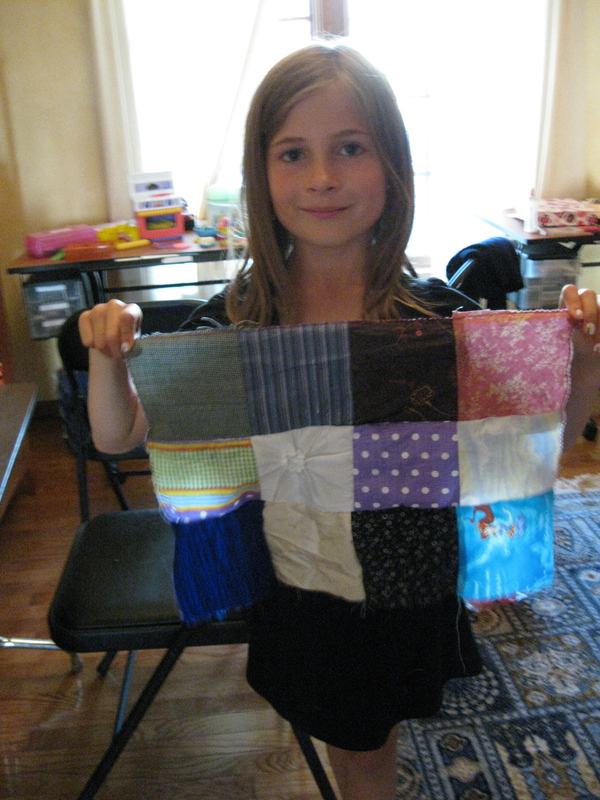 She cut a few 4″ squares from a variety of pretty fabrics. 3. We started with a safety lesson such as “never put your fingers under the needle, but instead, lay your hands flat on top of the fabric with one on the right and one on the left of the needle”. From this photo, you can see that she took the lesson seriously. 5. One by one she sewed the pieces and cut the threads. 6. And soon she had 8 pieces sewn together. 7. What a proud seamster. 8. Mira wanted to continue but I ran short on time. Next time I visit we will add more pieces to the quilt. Based on an N of one, I say that a 7 or 8 year old is definitely ready for machine sewing. What a great gift for a young child – a sense of accomplishment. After all, what is more important than mastering a new skill?